Mary Rose Museum, . Open every day (except 24-26th December): 10-5pm (November - March) and 10-5:30pm (April-October).. A purpose-built museum, home to Henry VIII's favourite ship. See the thousands of Tudor objects and personal possessions that were preserved when the Mary Rose sank at the Battle of the Solent in 1545. “". Holiday Inn Express Portsmouth - Gunwharf Quays, The Plaza, Gunwharf Quays, ☎ +44 23 9289 4240, . Westfield Hall Hotel, 65 Festing Road, Southsea, ☎ +44 23 9282 6971, . The Westfield Hall Hotel in Portsmouth, privately owned since 1980, has been stylishly redesigned to ensure your comfort and enjoyment. Our aim is to be the best quality 3 star hotel in Portsmouth, offering warm hospitality, fine food and accommodation at prices that represent remarkable value for money. 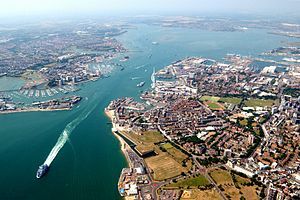 Ibis Budget Portsmouth, Fratton Way, PO4 8SL, ☎ Tel. (+44) 23 9273 6386, . Ibis budget Hotel Portsmouth is a low-cost hotel situated in Fratton, just a short drive from Portsmouth City centre. Easy access to the M27. Courtyard Portsmouth, 1000 Market Street, ☎ 1-603-436-2121, . checkin: 3:00PM; checkout: 12:00PM. The Courtyard Portsmouth is walking distance from the historic attractions in downtown Portsmouth. $109.